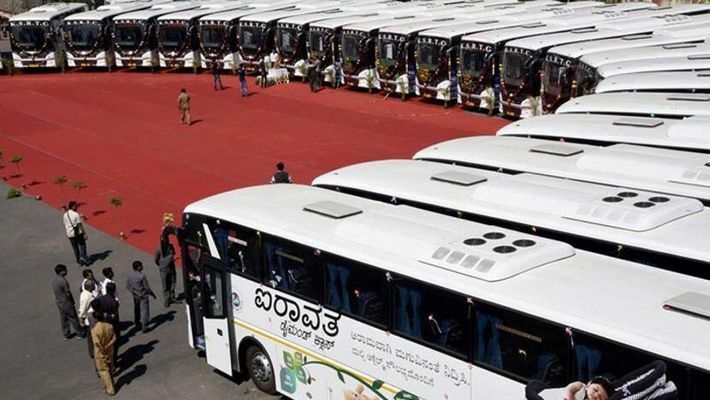 Bengaluru: In view of the Makara Sankranti festival on January 15, the Karnataka State Road Transport Corporation (KSRTC) has made elaborate arrangements and has added 500 extra buses into operation to accommodate the festive rush in its various depots. Along with this addition, a concession of 5 to 10 per cent on ticket bookings have been made available. "A discount of 5% on the fare will be extended for tickets booked for four or more passengers and a discount of 10% is offered on a return journey ticket for to-way journey bookings," said a KSRTC official. According to KRSTC, the rush that is expected from Friday onwards at Majestic, Shanthi Nagar, Vijayanagar, Indiranagar, Jayanagar, Mysuru Road, Malleshwaram, Vijayanagar will be difficult to handle with existing bus services, calling for the need of an additional 500 buses. Special buses will exclusively operate to and from Bengaluru Kempegowda Bus Station to Dharmasthala, Kukke Subramanya, Shivamogga, Hassan, Mangaluru, Kundapura, Sringeri, Horanadu, Davanagere, Hubballi, Dharwad, Belagavi, Vijayapura, Gokarna, Sirsi, Karwar, Raichur, Kalaburagi, Ballari, Koppala, Yadgir, Bidar, Tirupati and few other places. Similarly, special buses from Mysuru Road Bus Station will be operate to and from Mysuru, Hunsur, Piriyapatna, Virajpet, Kushalanagar, Madikeri. Few special buses will operate from Sri Basaveshwara Bus Station, Vijayanagara, Jayanagar 4th Block, Jalahalli Cross, Navrang (Rajajinagar), Malleshwaram 18th Cross, Banashankari, Jeevanbheemanagar, ITI Gate, Ganganagar, Kengeri Satellite Town to Shivamogga, Davanagere, Tirupati, Mangaluru, Kundapur, Sringeri, Horanadu, Kukke Subramanya, Dharmasthala and other places based on traffic potential. All premier special buses that run on the interstate route will operate from Shanthi Nagar bus depot to Madurai, Kumbakonam, Trichy, Chennai, Coimbatore, Tirupati, Vijayawada, Hyderabad and other places in Tamil Nadu and Andhra Pradesh/Telangana state. For more information in ticket bookings, timings, offer and more, log onto www.ksrtc.in.